I’ve been coveting a Robert Place deck for a long time now and lo! because I’m a dozy mare and got my Alchemicals and my Sevenfolds all mixed up, I will shortly be the proud owner of both the decks and the book and poorer than a Church Mouse. This is the 4th Edition of this deck and it has been funded via an Indigogo campaign. We’ve got four families – Staffs, Swords, Vessels and Coins; nice and traditional. Each family member sports their name and also the elemental glyph associated with that suit. 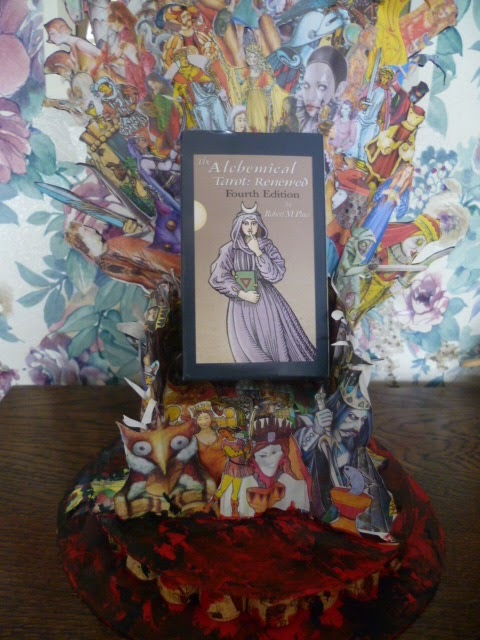 The first thing that you will notice about the courts in the Alchemical Tarot is that the Pages have been replaced with the rank of Lady and the second thing is that the King is not a figure but a creature. Each member of our Staff family stands in a progressively dry landscape, which is perfect because they are identified with the element of Fire (the glyph for fire is at the top of each card). The Lady of Staffs reminds me of the Page of Wands in the RWS – they adopt the same kind of pose with their Wands. In the Alchemical, all the Wands are ablaze. The Knight of Staffs, on the other hand, is in a fairly relaxed attitude which is NOT what we associate with him in the RWS. The Queen faces us, a burning sceptre in one hand and her flaming wand in the other. She is barefoot and bare-boobed. The King is a red dragon … which is probably a very alchemically thing, but I find him being the only creature in the suit a bit distracting. There will be a reason for it, but I don’t know what it is because the deck doesn’t come with any kind of LWB. Which is a pity. Moving on to the Swords family, we can see that the Lady of Swords plays a lute. This might strike you as odd, but the Sola Busca Tarot has the Page of Swords playing a lute too, so a nice nod backwards to this important and ancient deck. The Knight of Swords is the only Knight depicted with his face obscured and the only one involved in any kind of fighting. None of the Knights are on horseback. I am reliably informed that this is a Wyvern and not the red dragon of the King of Staffs. The Queen of Swords looks very much like the Queen of Staffs, same barefoot and balanced pose – sword in each hand. Curiously, a red wing and a green wing. Again, something that a LWB might have clarified for me. The King is an eagle. Or a lethal-looking chicken. Let’s go with the eagle. The other Swords are depicted amongst clouds, but the King has no background at all. The glyph for Air shows us that the suit of Swords is associated with this particular element. Now to the suit of Vessels. We see that theyare all found in or on water. All their vessels are different -alembics, jugs, goblets. The Lady of Vessels stands ON the water with a jug balanced upon her head. A light breeze ruffles the waves at her feet. The Knight wades through the water, holding up his golden vessel as if to take a swig from it. A little fish looks up at him – reminding us of the fish in the RWS Page of Cups. The waters around him are still and tranquil. The Queen of Vessels looks quite different to the other two queens we have encountered so far. She has both breasts bared and looks towards her suit symbol. She has the finned and fishy tail of a mermaid and she sits on the surface of the water. The Queen’s large vessel is closed and the stopper resembles a question mark. I’m sure that she is an alchemical figure, but it is infuriating to have a deck with so much glorious alchemical content and no handy LWB to refer to! The King is a crowned whale who seems to be spouting water into a huge goblet on his back. Except whales spout air out of their breathing holes in real life. Mind you, in real life they don’t have crowns or goblets on their backs…. The sea around him is white with choppy waves. Just as the Lady of Swords had her suit symbol above her, so the Lady of Coins can have her suit symbol in the coin-like lunar disk in the sky or in the purse around her waist. She is elaborately dressed and stands before lush vegetation. The focus of her gaze is the flowers in her hand. The Knight of Coins holds a mace, not a sword and his suit symbol is on a great shield that he rests on the ground before him. He too stands amidst rich greenery, with a castle in the background – perhaps his home. The Queen of Coins is naked as the day she was born and her pose links her to the Queen of Vessels (without the fish tail of course). She cradles and gazes at a cornucopia, whilst holding a small unicursal pentagram in her right hand. Again the vegetation around her is lush and there are more buildings in the background – she is closer to home than the Knight. The King is a crowned lion. I’m sorry, but I can only think of Aslan when I see this chap. A great paw rests on a golden disk which contains the image of a lion rampant. Or self portrait. It’s a fully illustrated deck that gives you a choice of Lovers cards (one more risque than the other!) with enough similarities throughout the deck to the RWS to ensure that even a beginner reader could use it. Strength is at XI and Justice is at VIII – the traditional, pre-Golden Dawn positioning. There are some images that could do with clarification – for example, the 5 of Staffs is a hand with the five fingers burning; the Hanged Man is not the relaxed beatific saint but a struggling figure strung up by one leg. These image choices could all be easily explained in a LWB. But there is none included with the deck, which is a pity. There IS a large companion book, but it is purchased separately. It’s a beautiful deck and I love the muted antique colour-palette throughout. It’s a dream to shuffle and to use and, even with a limited knowledge of alchemy – it reads beautifully. I just wish that an LWB had been included. Tee hee, the lethal-looking chicken made me lol. Very interesting to have the Kings be a creature – forces of nature. I like the style; but a Lion as Pentacles when lions are Fire ? It's a wyvern because it has no wings ….the Lady of Vessels reminds me of Temperance or the Star. A deck for which a LWB is vital I think you may have mentioned this 😉 – and it seems pure laziness that one was not included. Viv – I'm wondering whether the lion has some alchemical meaning? I seem to have bought a few decks recently where there is no LWB. In most cases one has to go to a website and download a pdf (and print it out) which is a bit of a bind, but does allow the deck's creator a lot more space to give information. It doesn't really appeal to me, I'm afraid, though I love the lethal chicken and wonder what's with the Queen of Vessels triple lady beard look.